Quilt no 1, Christo's Gates in Spring was made by Wil in the Netherlands, and went to live with Virginia in Brazil. 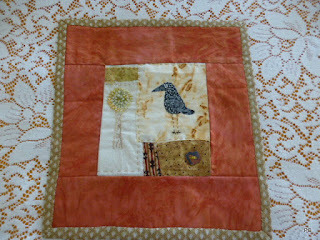 Virginia made quilt no 29, Carpe Diem, whicih went to Margaret J in Australia. 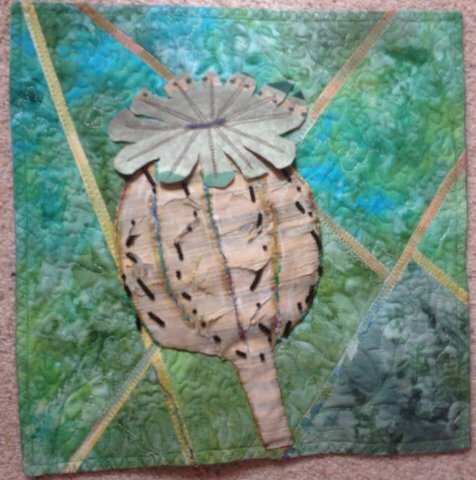 Margaret's quilt, no 24, Woodland Night, went to Marei in the US. 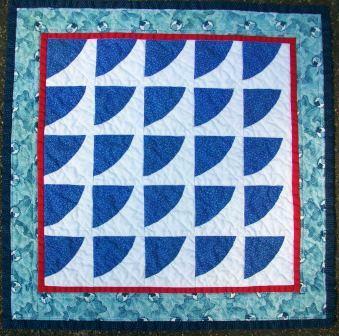 The quilt that Marei made, which was no 32: Feeling Blue, went to Margaret G, in the UK. Margaret G's quilt, Cornish Cottages (no 23) - which was the most requested quilt in this round of the swap - ended up with Joan E.
Joan (who is also in the UK) made quilt no 28, which ended up with Sarah (again in the UK - lots of UK quilts this time around). Sarah made two quilts for this round of the swap. The first of these, no 7: Hexie's Rock, went to live with Vreni in Switzerland. Vreni's quilt was no 19: A Blackbird's Delight. She sent it to Barbara C in Northern Ireland. Barbara also made two different quilts for this round of the swap. Here is the first, no 8: Dancing in the Rain, which went off to Barbara S in the US. 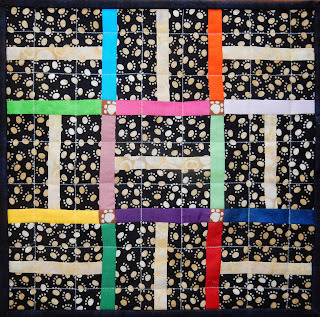 The quilt which Barbara S made - no 2 "Endless Pawsibilities" - went to live with Lyndsey in the UK. 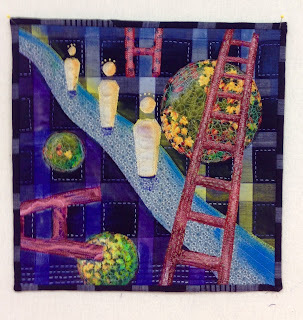 Lyndsey's quilt was called A Cat's Stairway to Heaven (no 35), and she sent it to Justine in the US. while Lise's quilt (no 6, The Silk Road) went to Di in the US. and Mary's quilt Bats at Twilight (no 18) flew off to Wil in the Netherlands. Which brings this little loop of revelations to a close. 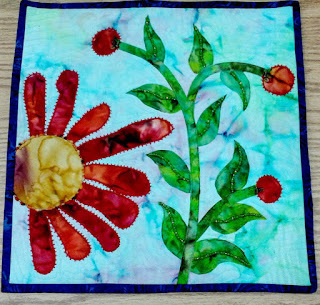 Penny in Australia, a long-time player in my swaps, made this little quilt (no 4), which went to live with Sheila in the UK. 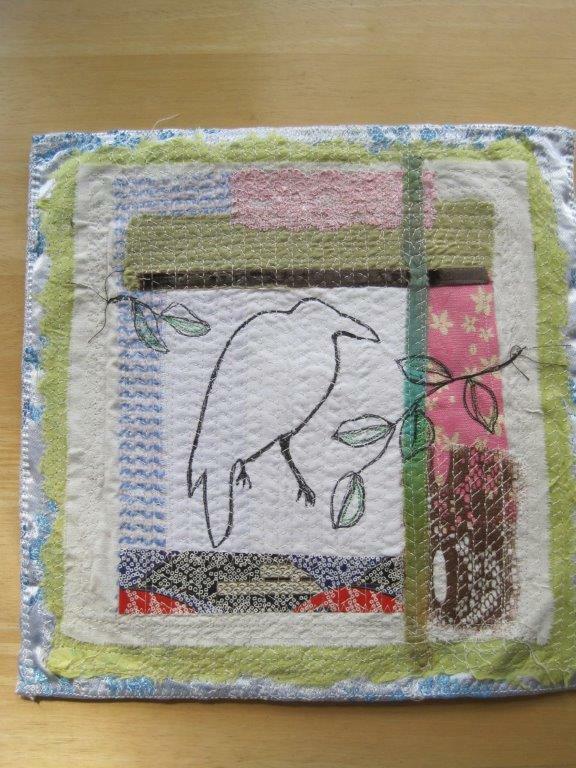 who made this piece - no 11 - which ended up flying off to Kathleen in the US. 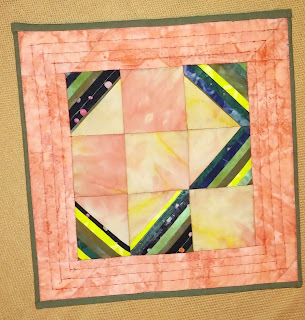 Kathleen was another of the players who made two quilt this time around, and the first of hers, no 14: Pretty in Pink, went to live with Sabine in Germany. 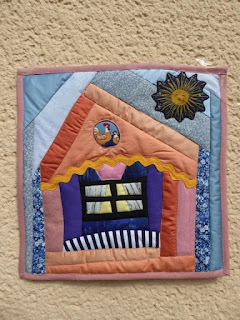 Sabine made the quilt Chicken House (no 12), which came to live with Jayne in the UK. and Pam's quilt Cottage on the Square (no 21) went flying off to Australia to live with Penny. And that brings another section of the reveal to a close. 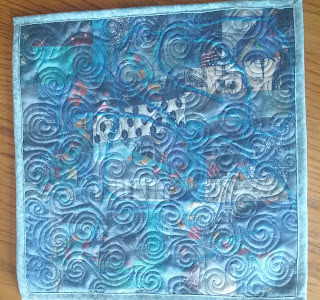 Ramona in the US, who has played in all (I think) of my swaps, this time around made quilt no 5, Blue Windows, which was chosen by Barbara C in Northern Ireland. 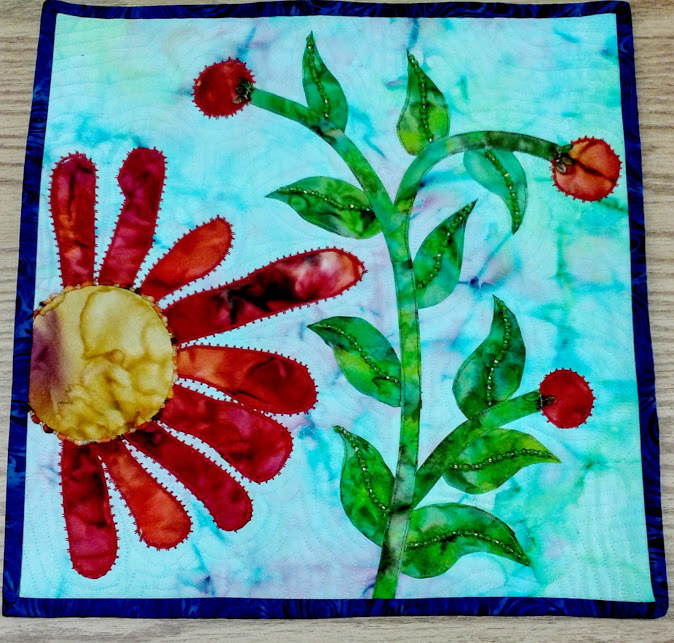 The second of Barbara's quilts, no 13: Summer Days, went off to live with Mary S in the US. 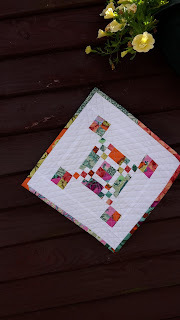 Mary also made two quilts for the swap, one of which - no 16 Shape Up - she ended up keeping; the other, Autumn Chickadee (no 15) found a new home with Kjersti in Norway. 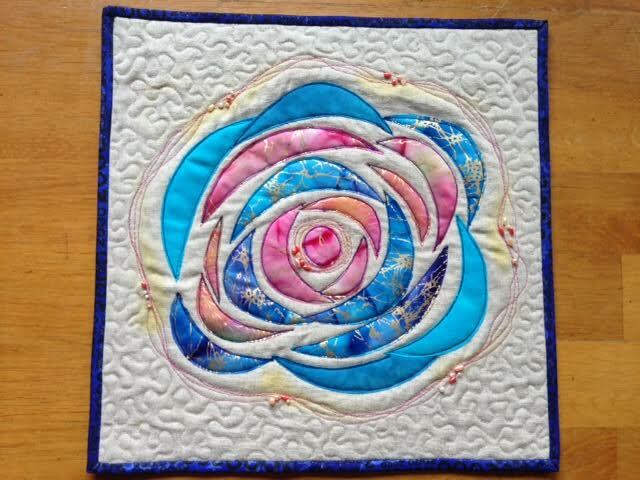 The quilt which Kjersti made - no 30, Blue Rose - went off to California to live with Julie. Julie was another person to make two quilts for the swap and her first one, When Pigs Fly (no 20) went to Tish, also in the US. Tish - also the maker of two quilts for this swap - made quilt no 38 (untitled), which ended up with Melody, in the US. 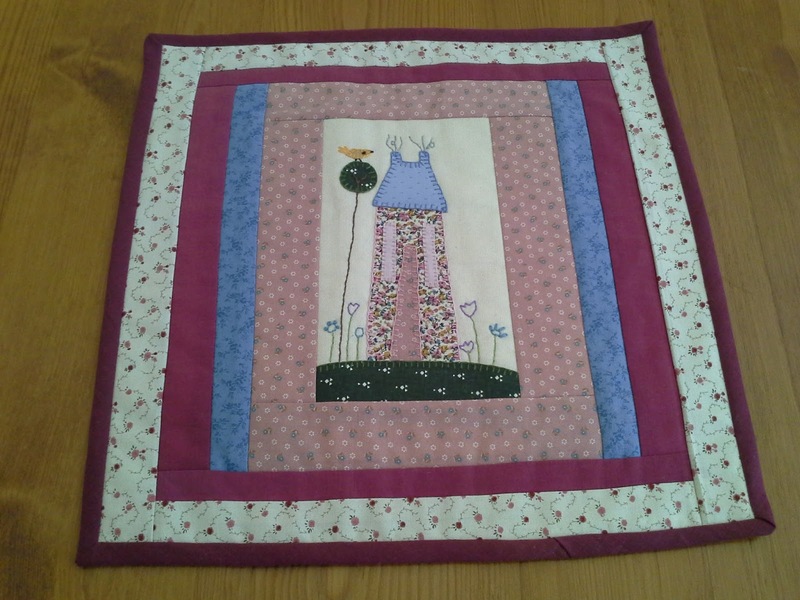 while Joan's quilt went to Sarah (also UK). 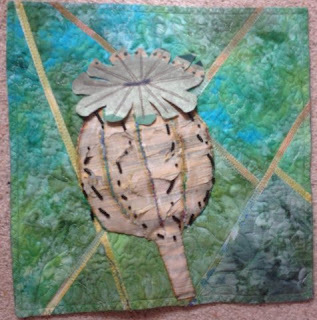 That quilt was called New Life From Decay (no 27). Sarah's quilt - her second in the swap - was no 31, Little Bird - and that went to Ramona. Which ties up that strand nicely. Julie's second quilt, Wildflowers (no 22) went to Andrea in Australia (who just happens to be Julie's sister - but Andrea didn't know who had made the quilt when she put it on her list). 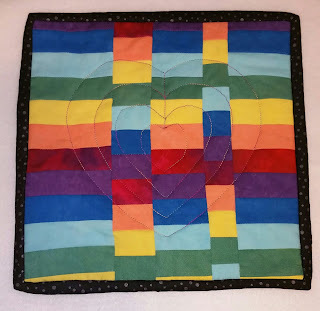 while my own quilt, Squaring the Circle (no 25), went back to California to live with Julie. 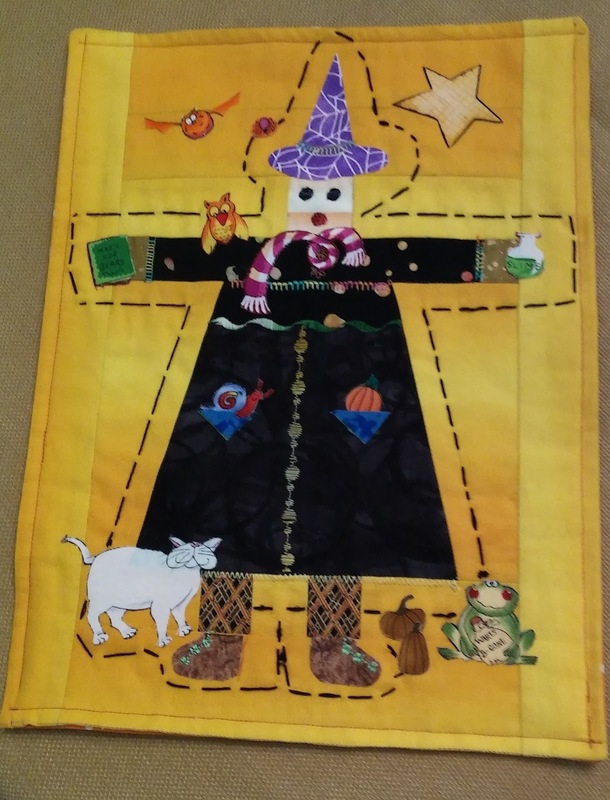 Julie and I have been friends for many years and I actually have one of her quilts from a swap long ago, but this is the first one she has of mine, so that's fun. 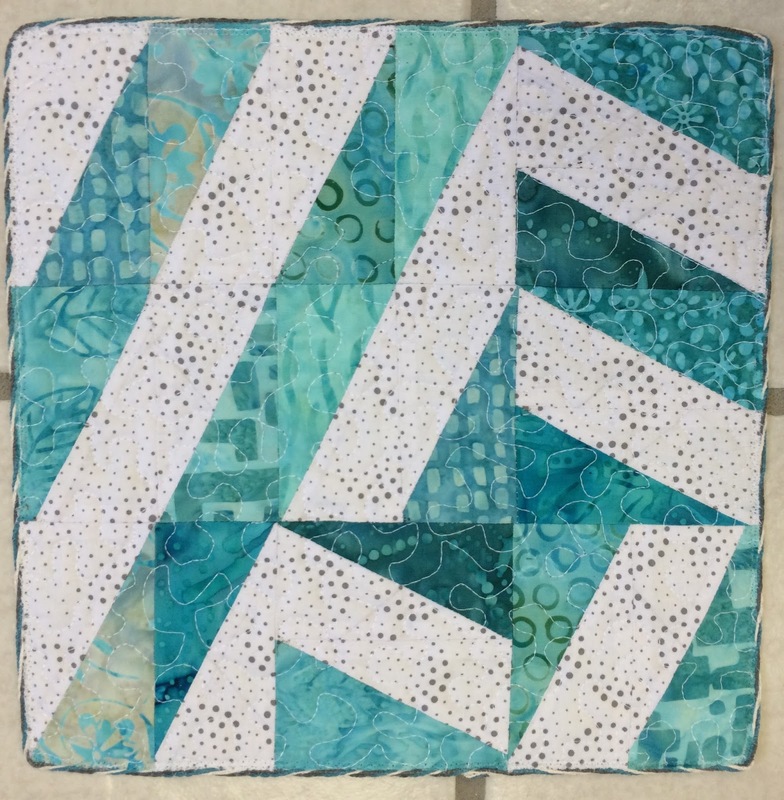 while Marie's untitled quilt, no 34, went to Sue. 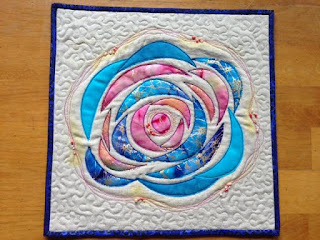 while Kathleen's second quilt, no 39: Friendship Flower, went to Tish. And that, ladies (and gentlemen - though we didn't have any playing this time around), is that. ALQS10, revealed in all its glory. Tune in again in 2017 for another round - I hope you can play along! 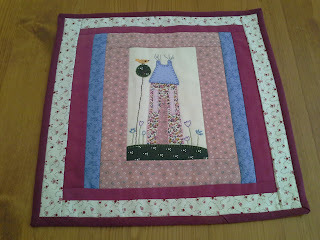 I've now confirmed that all the little quilts have been received - yay! I hate worrying that people's work is lost in the post. I hope to have a Grand Reveal done sometime later this week - it will depend on how tired I am with my first week back at work - though it's a good week to catch up as most of our regular evening activities haven't yet started. Hi everyone - sorry to be out of touch, I have been away for a couple of weeks. 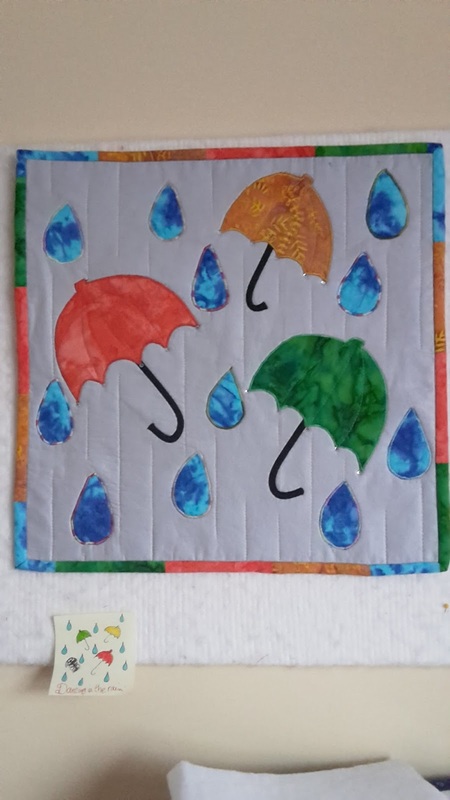 I think that everyone has now mailed their quilts to their new homes, and most of them have been received. I may need to check with a couple of people I haven't heard from, but very soon I expect to be able to do the Grand Reveal (also allowing for time to write the blog post, given that school (and thus my job) starts again tomorrow). 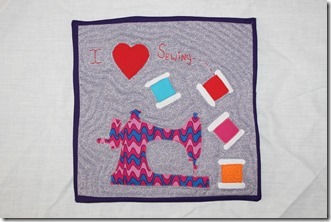 Thanks for your patience - hope you are all enjoying your new little quilts! Well, that wasn't TOO stressful. I have successfully matched up all but one of the quilts with new owners, and everyone who played will be getting at least one quilt swapped out. 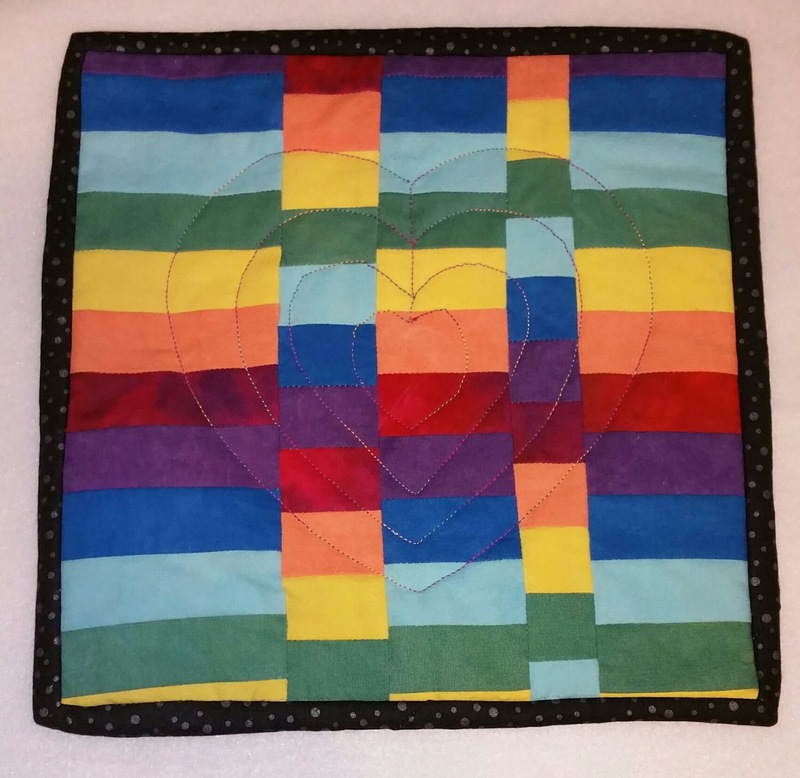 The unswapped quilt wasn't unloved, but the way the logistics of these things work, sometimes the same small group of people like the same small group of quilts, and swapping out can be very complicated. 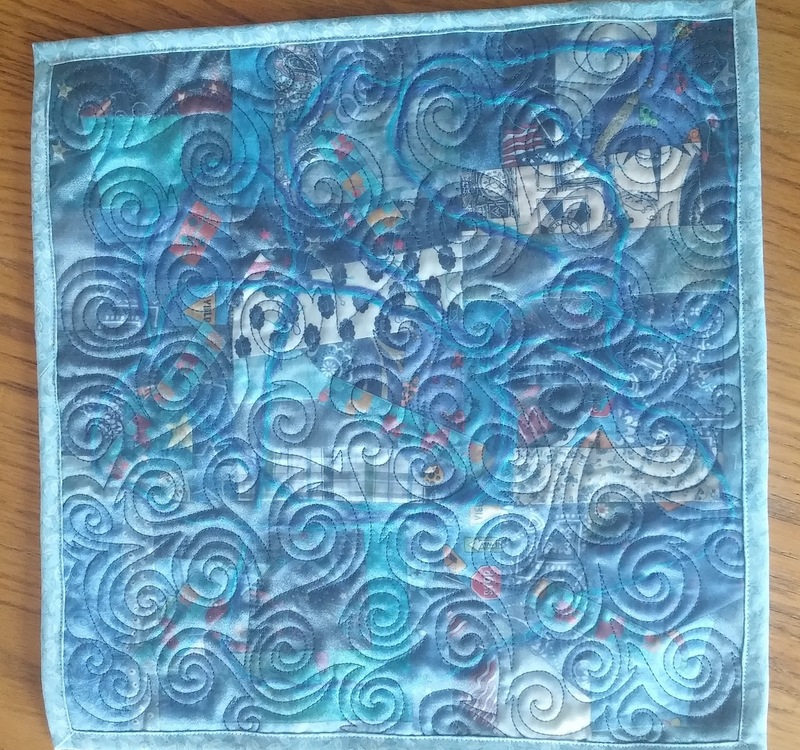 This time around, I elected to ask a person who made two quilts to keep one of them so that everyone else in the swap could have a quilt swapped out. She'll still going to get one quilt in the swap, which makes me as happy as I can be, when I can't swap all the quilts in the whole swap. Find a new home for the greatest number of quilts possible. 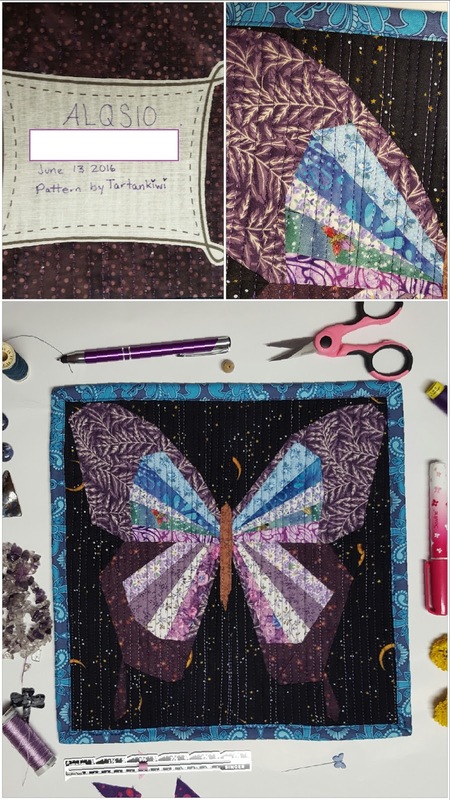 Try to give people quilts as high on their lists as possible (in all cases, but particularly if someone has made a very popular quilt). If a quilt is on someone's preference list, they did like it, so it's better to give someone one lower on their list than to leave a quilt unswapped. If the above criteria have been met, try to give everyone quilts by people they haven't had quilts from before (so e.g. 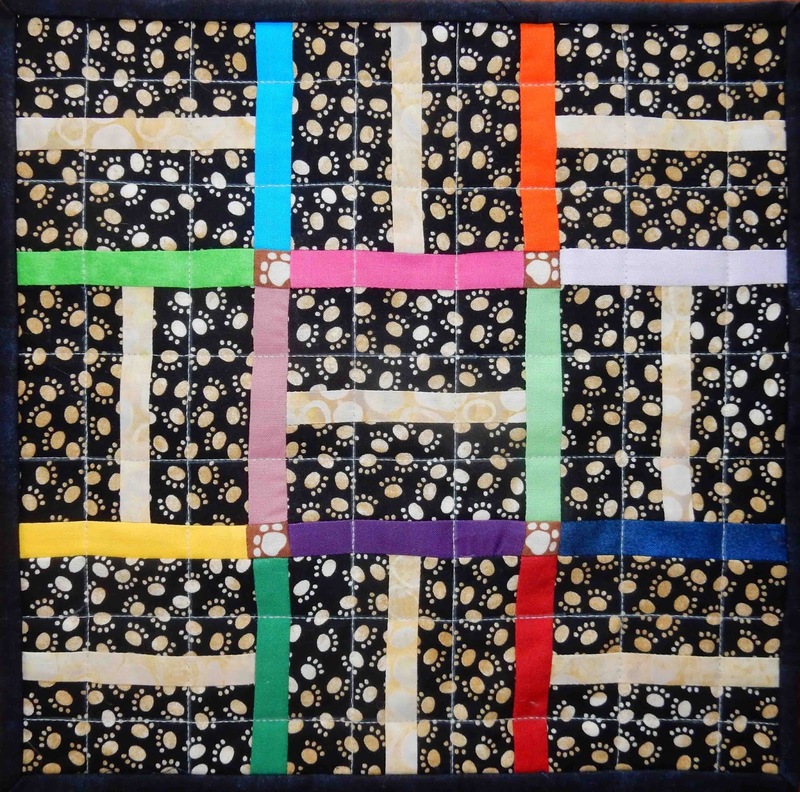 if Ann's quilt and Jane's quilt were both in your top tier of preferences, but you had a quilt from Ann last time around, I might give you Jane's this time). Anyway, that's just a little insight into the process - it's a lot more complicated than that, and I do appreciate everyone's flexibility in listing loads of choices and being patient! 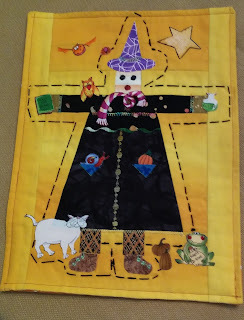 I'll be emailing people over the next few days with instructions for how and where to mail your quilts. Watch your email!